1 - The first one is the memo that Lt. General Nathan F. Twining, head of the Air Material Command (AMC) sent to Brig. General George Schulgen, Chief of the Air Intelligence Requirements Division, on September 23, 1947. The final purpose of that memo is the recommendation for the creation of “detailed study” of the “flying discs” (as they were then called). (1)The possibility that these objects are of domestic origin - the product of some high security project not known to AC/AS-2 or this Command. A - A domestic origin is not discarded. B - Had de incident near Roswell being something strange, the second paragraph would be nonsense. C -The speculation about the origin of the “flying discs” is referred to nations. In 1947 there was not room for “extraterrestrials”. 2 - The second one is the press conference given by Major General John A. Samford, USAF Director of Intelligence. Have in mind that this press conference took place on July 29, 1952, after lights were seen over the capital of the U.S. in two opportunities during that month. Also, it is necessary to understand that Major General Samford is talking to the press in the Pentagon, the headquarters of the Department of Defense, and is speaking as a military authority, not giving his personal viewpoints. It is outstanding that he speaks about “man-made activity in the air”, not about alien activity. Four statements are made here, all of them extremely important because I think they are intrinsically related with the UFOs origin. -Phenomena associated with intellectual and scientific interests. -They are on the road to learn more about, which implies that they already know something. The only possible conclusion to infer from these words is that Major General Samford and some other people in the USAF already have a very good idea about who was the intelligence (the intellectual and scientific interests) behind the flying discs. I can assure that nobody in the United States, and much less a military authority would dare to publicly make that affirmation if it were not true. The affirmation that UFOs "do not constitute a menace to the national security of the United States” has thereafter being repeated many times by different authorities and agencies. This last statement made by Major General Samford obliges to pose the question about who could have at that time those “intellectual and scientific interests”. Were they by chance associated with “reports going back to the Biblical times”. Conclusion: In the span of 5 years, apparently certain circles in the USA were enough acquainted about who could be behind the “flying discs”, and if there was a pact –as it could be presumed there was— the responsible for the “flying discs” received some guarantees and protections, in exchange for technological transference and the freedom to continue with some experiments. Some of those experiments could have implied the use of animals and human beings too and –of course— provided such thing happened, it must have been related with intelligence and the military. Civilians were mostly out of the equation. If this is possible and has an intrinsic logic, then we can think not about a parallel universe (in terms of Physics) but of a parallel reality, in physical terms. 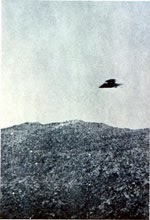 The idea that the “flying discs” could be or –as some people still believe— extraterrestrial origin, was elaborated by some military personnel of intelligence within the USAF, was astutely used by the US Navy, and served as a cover-up for experimental aircrafts and aerial activities, as well as for operational projects. But that idea finds its support in the totally different shape and dynamic characteristics of the “flying discs” which indeed have been very revolutionary, and couldn’t be recognized as something following the technological patterns already used and known in the Western world and other parts of the planet. Every time a pilot, or even a scientist, said something like: “the object performed incredible maneuvers impossible for an airplane to do, and developed suddenly tremendous speed” they have found as the easiest and most possible explanation what is summarized in this phrase: “that is not of this world”. But yes, it is or it could certainly be of this world, but not following the basic tenets of the Physics developed in the Western nations, (US, UK, France, etc), but different ones. And that special circumstance was what allowed a small group of people to develop new forms of energy applied to flying artifacts, probably remotely controlled. That group of people was far ahead all the other scientists and technicians, and maybe they found inspiration and even more, in their “scientific and intellectual interests”, looking for some artifacts from the Biblical times. I leave to the reader to think about what group of people could have been originally behind the “flying discs”. In the meantime let me say that at the very beginning of the “flying discs” issue, military authorities and the people in general, thought about three possible origins, all of them terrestrial of course. The E.T. idea began and it is deliberately promoted starting in 1950.